Ever since I did my Cocoa Butter Hot Oil Hair Mask I’ve been thinking it would be nice to have a more “ready to use” hair mask with even more goodness added in. So I whipped up this big batch of hair mask, tried it out, and it works amazing! The best part is it’s easy to grab for and do it even if you only have 20 minutes to spare for a hair mask! I usually use a plastic bag and a head towel to do hair masks but now that my hair is longer I’ve been clipping it up with a clip like this and just throwing a designated hair-mask-shower-cap over it for an hour or two. It works like a charm--and there’s less waste! I think next time I’m in the market for a shower cap I’ll try and find a smaller one though. The one that I use fits like the image so it’s a little much, but it works great none the less! I really liked the way this hair mask turned out. It smells like a mix of cocoa butter, which smells like chocolate, and rosemary. Like the other cocoa butter mask this one left my hair feeling bouncy, shiny, and moisturized! I’m so excited for the added convenience of having a big batch ready to go whenever the moment strikes. I use this kind of ball jar as the container. I get my cocoa butter, coconut oil, jojoba oil, and rosemary oil all on amazon. The olive oil I buy at the grocery store. Once you have all the ingredients it’s super simple make! If you don’t have a double boiler don’t worry, I don’t either. When I need a double boiler set up I just use a metal bowl and a pot that the bowl doesn't fit into all the way. For the water I add about 1/4 cup to 1/2 cup to the pot. If you would rather use the microwave you could do that too. Grate cocoa butter. 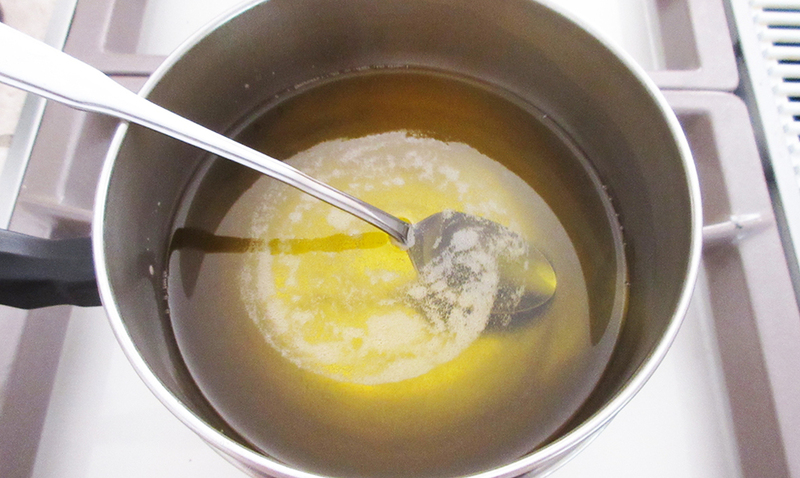 Add everything but the rosemary oil to your double boiler set up, or a microwave safe bowl. If you’re double boiling, let the oils melt together over low heat until combined and all the cocoa butter is melted down, stirring occasionally. For the microwave, simply microwave the ingredients until they’re combined. Pour the hair mask into a jar and place in the fridge or leave out. The hair mask will remain a liquid so you could keep it in the fridge before use, like I do, or simply pour it into your hand and apply to your hair. Apply to your hair from roots to tips or tips to roots depending on where you would like to focus the treatment. Put a plastic bag or shower cap over your hair. Wrap with a towel to keep the heat in if desired. Let sit for at least 20 minutes, the longer the better. I usually aim for around 2 hours. Once you're done, wash your hair as you normally would. You may have to shampoo twice depending on your hair and how much oil you use. I hope this hair mask does wonders for your hair as well as adds convince to your hair mask routine! Do you have any special hair care tips or tricks that you swear by? I'd love to hear! Have a great weekend everyone!